Fig. 1. Mönsterås Tidningen, front page, 13 Mar. 1886. O (Thou) great God! O (Thou) great God! Thanks, gracious God! Thanks, gracious God! By 1890, the text had already been transmitted to the United States, where it appeared in Sionsharpan (Chicago: Mission Friend’s Publishing Co., 1890 | Fig. 2), printed with a version of the Swedish folk melody known today as O STORE GUD. Textually, this version omits the original ninth stanza. Musically, this form of the melody is given in 3/4 time with a rising opening interval, 1-1-1-3, rather than the more familiar descent, 5-5-5-3. Fig. 2. Sionsharpan (Chicago: Mission Friend’s Publishing Co., 1890). The following year, when Boberg was editor of the periodical Sanningsvittnet (“Witness of the Truth”), he published his poem again, this time with the Swedish folk melody, on 16 April 1891 (Fig. 3). It seems, based on this printing and the previous one, Boberg had written his text with this melody in mind, except some accounts of Boberg’s experience have described how he had attended a meeting in Värmland and was “surprised to hear his poem being sung to the tune of an old Swedish melody.” Whether by intention or by divine serendipity, these two vehicles have been almost inseparable. Boberg’s 1891 printing is notable in many respects, including (1) the full arrangement for voice, piano, and guitar, composed by Erik Adolf Edgren (1858–1921), (2) the shape of the opening notes, 5-3-3-5, (3) the martial, dotted rhythms throughout, and (4) the way the melody ends downward rather than climactically upward. Fig. 3. Sanningsvittnet, 16 April 1891. One other printing in Swedish of some importance is the appearance of this song in Svenska Missionsförbundets Sångbok (Stockholm: P. Palmquists Aktiebolag, 1894 | Fig. 4). This copy contains the full nine stanzas. The key variations here are (1) in the rhythm, being expanded to 4/4, (2) in the first melodic phrase, starting 5-5-5-3, and (3) the shape of the last melodic phrase, rising upward stepwise before returning to the tonic. This form of the melody is the one still in common use in English and elsewhere. Fig. 4. Svenska Missionsförbundets Sångbok (Stockholm: P. Palmquists Aktiebolag, 1894). Russian Translation. A prolific Russian compiler and translator, И.С. Прохановъ (I.S. Prokhanoff; transliterated spellings vary), published his translation of the hymn as early as 1908 in Кимвальi (“Cymbals”), in eight stanzas, text only (Fig. 5). A music version appeared as early as 1923 (Fig. 6). This Russian version includes all the Swedish stanzas except for number six, and it transposes the order of the third and fourth stanzas. The last stanza is arguably a new stanza rather than a direct translation of Boberg’s ninth. The quote at the top is from Psalm 18:2 (“The heavens declare Your glory”). Fig. 5. И.С. Прохановъ, Кимвальi (St. Petersburg, 1908). Fig. 6. И.С. Прохановъ, Кимвальi (1923). German Translation. Boberg’s Swedish was translated into German by Manfred von Glehn of Estonia, published as “Wie gross bist Du!” in Blankenburger Lieder (Blankenburger: Evangelischen Allianzhauses, 1912 | Fig. 7). Glehn’s text of six stanzas represents 1-2, 5, and 7-9 of the original Swedish. 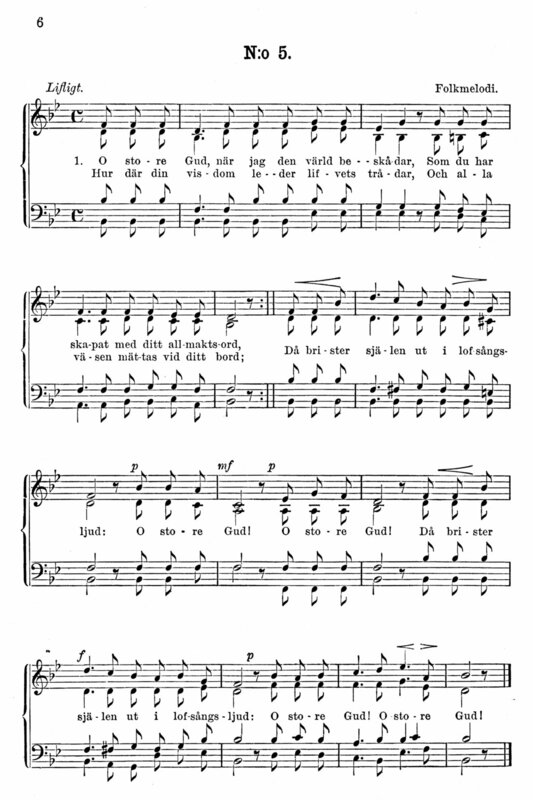 The music is very close to the 1894 Swedish, except for a couple of added dotted rhythms and a few changes to the harmonization. Fig. 7. Blankenburger Lieder (Blankenburger: Evangelischen Allianzhauses, 1912). Some matter of debate surrounds the connection between the Russian and German versions. Stuart Hine, in his 1958 account, believed the Russian was translated from the German, based on the similarities in the penultimate stanza not found in the Swedish (the injection of the phrase “even unto death”), although Hine acknowledged how the similarities could be incidental, a natural extension of the meaning of the original words. In addition, Prokhanoff is said to have been skilled at translating hymns from German. 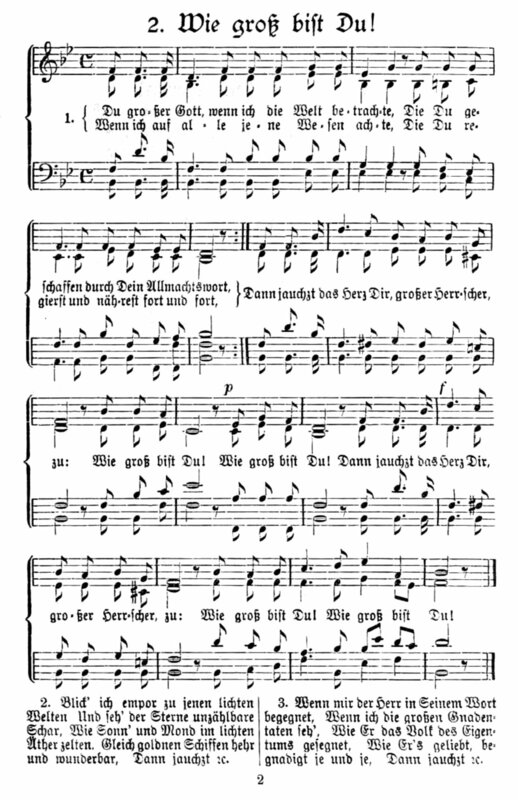 Contrary to this theory, the German version is only six stanzas, whereas the Russian is eight; the Russian predates the German, and the Russian version of the music is nearly identical to the 1894 Swedish, more than it is to the German. A more likely scenario is that the two translations were developed independently, the Russian coming first. If one influenced the other, the Russian would have influenced the German. First English Translation. The Swedish text was first translated into English by E. Gustav Johnson (1893–1974). His translation initially appeared in 1925 in The Children’s Friend, a periodical produced by The Swedish Christian Orphanage in Cromwell, Connecticut (now Ädelbrook | website). 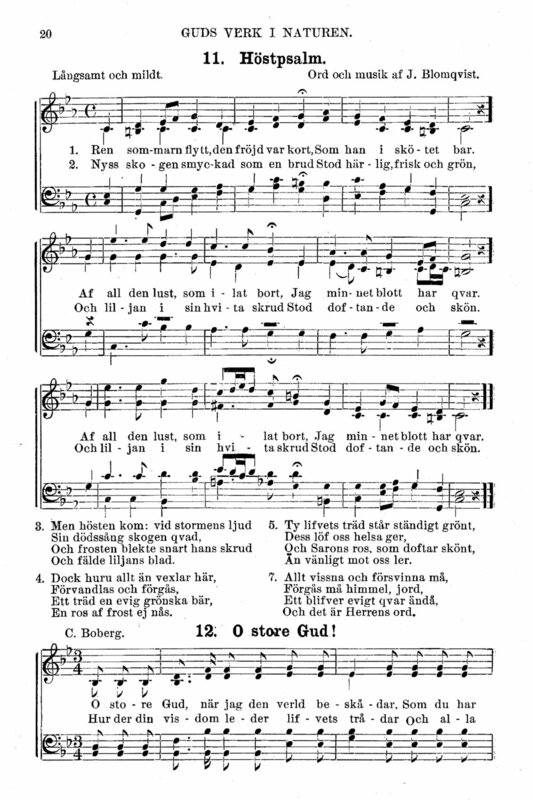 His text and the Swedish melody were then published together in The Covenant Hymnal (Chicago: Covenant Book Concern, 1931 | Fig. 8), under the auspices of the Swedish Evangelical Mission Covenant of America. Johnson’s version corresponds to stanzas 1-2 and 7-9 of the original Swedish and is a more faithful translation than the more popular version that would come later. Johnson’s translation uses the 3/4 version of the melody, as in the 1890 Chicago printing at Figure 2. Fig. 8. The Covenant Hymnal (Chicago: Covenant Book Concern, 1931). In the very first Carpathian mountain village to which the writer climbed, he stood in the street, sang a Gospel hymn, and read aloud John chapter three. Among sympathetic listeners stood the Russian village schoolmaster. But a storm was gathering, and when it was evident the missionary would not get any further that night, the friendly schoolmaster offered hospitality. Awe-inspiring was “the mighty thunder” echoing through the mountains, and it was this impression which was to bring about the birth of the first verse of the hymn in English. Pushing on, the writer crossed the mountain frontier into Romania, and there in the Bukovina (“the land of the beech tree”) found believers. Together with the young people, “through woods and forest glades” he wandered, and “heard the birds sing sweetly in the trees.” Instinctively, the young people burst into song, accompanied on their mandolins and guitars—the only song so perfectly fitting the scene: “How great Thou art,” to I.S. Prokhanoff’s words. Thus, inspired by the Russian words, partly by awesome wonder at the sight of “all the works Thy hand hath made,” the thoughts of the first two verses sprang to life in English. The third stanza came to fruition a short time later in another village, after the Hines led twelve unbelievers to Christ. The fourth was written in 1948 after they had returned to Britain. Hine published his version of the hymn—which is best regarded as inspired by the Russian version, not translated from it—in a Russian magazine he edited, Grace and Peace, in 1949, “which went out gratis to refugees in fifteen lands, including North and South America. Requests for extra free copies made it necessary to reprint the page containing the hymn—2,000, 3,000, 5,000 copies, and so on. … The hymn was thus well known, worldwide, long before a single copy was ever sold.” None of these early printings are known to survive. Attending the Forest Home college-age conference were Hal Spencer and his sister, Loretta, son and daughter of Tim Spencer who was a songwriter and publisher of Christian music. Hal and Loretta borrowed the song sheet from Dr. Orr and brought it home and gave it to their father. He contacted Stuart K. Hine and the publishing rights were granted to Manna Music, Inc. Fig. 9. “How Great Thou Art” (Burbank, CA: Manna Music, ©1955), excerpt. The completed song was printed in 1949 in a Russian gospel magazine published by Mr. Hine. Reprints were requested by missionaries all over the world, and it was one of those leaflets that was given to us in 1954. We first sang “How Great Thou Art” in the Toronto, Canada Crusade of 1955. Cliff Barrows and his large volunteer choir assisted in the majestic refrains. Soon after, we used it on the “Hour of Decision” and in American crusades. In the New York meetings of 1957, the choir joined me in singing it ninety-nine times! It became a keynote of praise each evening. The song was included in Billy Graham crusade songbooks (Fig. 10). George Beverly Shea and the Toronto Crusade Choir recorded the song in 1955, and it was released on plasticized paper records, as in Figure 11. Fig. 10. Billy Graham Crusade Songbook (Minneapolis: BGEA, 1956), excerpt. Fig. 11. “How Great Thou Art,” 78 rpm phonograph on plasticized paper (Minneapolis: BGEA, 1955). In many ways, this text can be regarded as a post-Romantic Christianizing of Psalm 8. It is an expression of what is known as natural theology, the tendency to find a Creator implied by and reflected in creation. In the third and fourth stanza here, such natural theology is blended with revealed theology, the understanding of God derived from the revelation of Scripture. Stuart K. Hine, The Story of “How Great Thou Art” (1958), p. 4. George Beverly Shea, “How Great Thou Art,” Crusade Hymn Stories (Chicago: Hope Publishing, 1967), pp. 9-10. Carl P. Daw Jr., “O Lord my God,” Glory to God: A Companion (Louisville: Westminster John Knox, 2016). pp. 593-594. Fred D. Gealy & Austin C. Lovelace, “O Lord my God! When I in awesome wonder,” Companion to the Hymnal (NY: Abingdon Press, 1970), pp. 322-323. Marilyn Kay Stulken, “How Great Thou Art,” Hymnal Companion to the Lutheran Book of Worship (Philadelphia: Fortress Press, 1981), pp. 542-543. William J. Reynolds, “O Lord my God! When I in awesome wonder,” Handbook to the Baptist Hymnal (Nashville: Convention Press, 1992), pp. 205-206. Carlton R. Young, “How Great Thou Art,” Companion to the United Methodist Hymnal (Nashville: Abingdon Press, 1993), pp. 409-411. Bert Polman, “How Great Thou Art,” Psalter Hymnal Handbook (Grand Rapids: CRC, 1998), pp. 650-651. Christopher M. Idle, “O Lord my God! When I in awesome wonder,” Exploring Praise! (Darlington: Praise Trust, 2006), pp. 156-157. Paul Westermeyer, “How great Thou art,” Companion to Evangelical Lutheran Worship (Minneapolis: Augsburg Fortress, 2010), pp. 742-744. Joseph Herl & Kevin Hildebrand, “How great Thou art,” Companion to the Lutheran Service Book (2019).